If you’re thinking of attending a MovNat Certification event, and you’d like some advice from an insider’s perspective, check out this group interview with four of our Team Instructors, which will help you get prepared for any MovNat event, and especially the more difficult, higher level certifications. Note: Level 2 and Level 3 certifications are on sale until Thursday. Use coupon code “LevelUp2” for $200 off any Level 2 certification, and “LevelUp3” for $300 off our Level 3 certification. See below for additional details. What is the most important thing people should know about the Level 2 and Level 3 MovNat Certifications? Stefano Tripney: It’s important to realize that there is a significant jump in both skill difficulty level and the required conditioning for both levels. However, the jump between L1 and L2 is much milder than from L2 to L3. 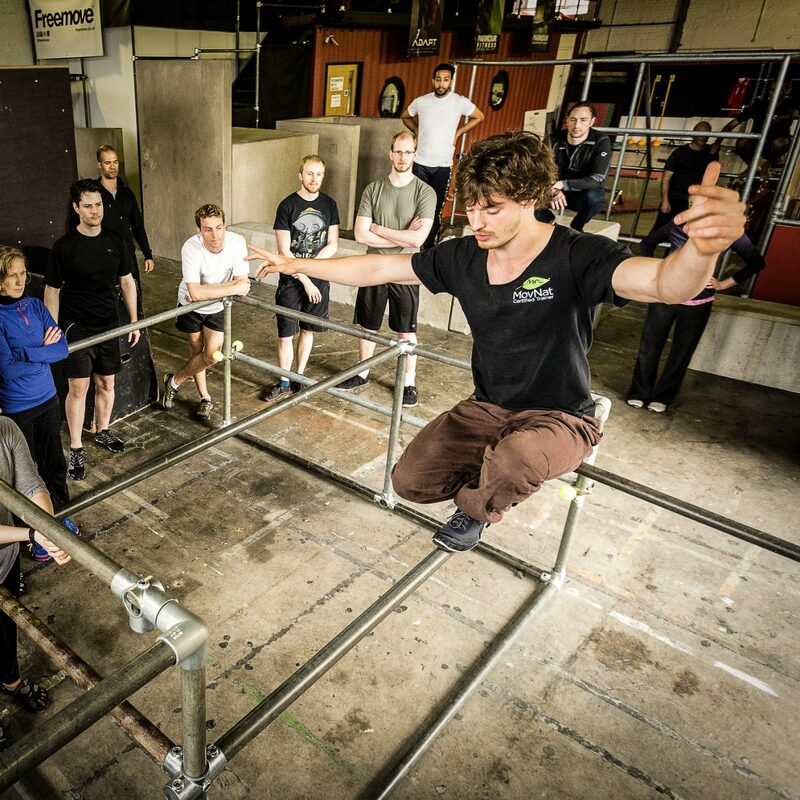 The level 3, being the pinnacle of the MovNat certification, is a rather big leap in terms of complexity, intensity, and ones overall ability to adapt to various contexts. It is demanding mentally as well and certainly takes the candidate well out of their comfort zone. What is important to remember is that the progression towards the next set of skills is contained in the existing skillset you have. In other words, to accomplish a climbing skill in level 2 which requires more strength or better timing, you need not detour in any way outside of the MovNat realm. By practicing the level 1 skills consistently and adding just a bit more intensity, complexity, and volume, you are already making huge strides towards the requisite demands of the level 2 climbing skills. It can present a healthy challenge, but it is certainly attainable with the proper coaching and consistent practice. I have seen this in every occasion teaching a certification. Candidates feel they are unable to perform a particular skill on day one, and by day 2, are smiling ear to ear while completing multiple repetitions of that very movement. The bottom line is our coaches have the knowledge and ability to unlock these capabilities for trainer candidates, and do so all the time. Jerome Rattoni: You will discover and be part of an even tighter community of passionate movers. MovNat has this ability to attract genuinely good people. Men and women who understood that fitness is the by-product of being strong, healthy, happy and free. L1 gives not only the basis but opens to interact physically or online to hundreds of other MCT’s. And when it’s time to embrace L2/L3, this is your opportunity to meet them and succeed all together, to learn from each other and even to plan new events everywhere possible. The journey is filled with new skills and adventures, but also new friends along the way who match the same lifestyle as yours! Priceless. Bernd Reicheneder: Preparation and sincerity! This is not for those of you who are collecting certifications. This is for the one who wants to represent the most professional fitness method on the planet. To teach MovNat in a professional way you have to feel movement. This must extend deep into you, in order to pass it on to someone else. Otherwise, the essence, the communication with your body won’t happen sufficiently. Fitness systems that emphasize conditioning focus on feeling pain/no pain. Movement, on the other hand, can feel efficient or inefficient. What advice would you give an MovNat Certified Trainer who’s thinking about and/or preparing for the higher level certifications? Stefano Tripney: Reach out and connect with someone who has done it. Consider MovNat online training to polish up skills or push you towards more conditioning. The more prepared you are, the better experience it will be. You will certainly take away more and benefit from the event. Craig Rice: The higher level certifications are more physically challenging. If you are hoping to pass the level 2 course, the level 1 movements should be very easy for you. To have a chance at passing the level 3 course, the level 2 movements shouldn’t be a challenge for you. Of course, you’ll have some time to resubmit tests after the course is done, but it’s nice to be prepared. Bernd Reicheneder: Practice and feel what you are doing. Play with complexities and stamina. Complexities mean unforeseeable or unused situations or environments, which pose some form of risk which should be measurable. Stamina means not stopping just because it hurts. Keep up the communication with your body and know if it is just lack of endurance, laziness, or a real danger to ones’ health. How have the higher level MovNat certifications benefited you, personally? Stefano Tripney: I have learned so much just by surrounding myself with the other trainers and candidates. Everyone brings something of value to the table. Insights, drills, stories, breakthroughs, games, coaching strategies, skills that are incredibly inspiring. You never know where you might find the missing piece that changes everything. But chances are, when you hang with talented and intelligent movers, you’ll pick up a lot in just a little time. Personally, I learn something of value every single time I coach or listen to another coach. Just this past level 3 in New Mexico I learned different methods of mounting a rail and vertical hanging that changed my entire outlook! After teaching it for years there is still so much to absorb from others’ experience. We are always students but we must maintain and nurture this attitude and seek to always learn. Nuance is everywhere. Jerome Rattoni: It set goals for me, to train harder, to prepare for the due date, to feel the pressure and overcome it. It also helped post-event to work on my weaknesses and come back stronger. Craig Rice: The higher level certifications helped to improve my confidence and made my movement more efficient. I still spend most of my time teaching the level 1 & 2 material, but the level 3 made me a more effective MovNat trainer and helps to spice up my own training. Bernd Reicheneder: I really felt part of a tribe from that point on! I knew where I belong. It‘s not just likeminded people who love doing the same thing. A tribe in its original meaning is situated as a part of nature and acting in harmony with it. That’s what MovNat is. Why should a MovNat Certified Trainer pursue the next level certification? Stefano Tripney: Don’t be complacent with where you are at. Take on a challenge that will motivate you AND your peers or clients. The amount of information available in the higher courses and the methods of delivery are incredibly rich. You will benefit as a coach and have the tools with which to pass it on. Personally, the level 2 but certainly the level 3 acted as a segue to higher skills development that I previously had thought were out of my range. Rail balancing, precision jumping, and vaulting were some of these false limitations I had imposed on myself. I felt that in my mid-late 30’s I had missed the boat on these particular skills and was complacent on never having the ability. I was proven wrong and shown otherwise. My confidence was bolstered and this mix of positive reinforcement and energy was immediately palpable to both myself and those around me. I then took this newfound freedom and emboldened others towards breaking personal barriers and accomplishing more than they ever thought possible. Bernd Reicheneder: Every certification level gives you more insight in an endless pursuit to reconnect to your true nature. A new level means not just developing new skills in an extrinsic way and deepening their effects on your organism. The intrinsic part expands your feeling and knowledge of the endless natural functions of your body and how to integrate it into you life to develop into a real living example of a natural mover. Jerome Rattoni: Because you are a MovNat Certified Trainer :-) Providing more and more advanced skills to our students is a great goal to have. Interested in the MovNat Certification? 4 Steps to Prepare For the MovNat Certification (FREE Training Program).